I have been interested in learning about both World War One and World War Two since I went to Ypres last year and have read a lot of books about history and fighter planes. I am now really looking forward to going to see the new Dunkirk film with my Dad, I have read some really good reviews of it. I was very excited when Airfix asked if I would be like to try out their new Quick Build Sets ahead of the release of Dunkirk. 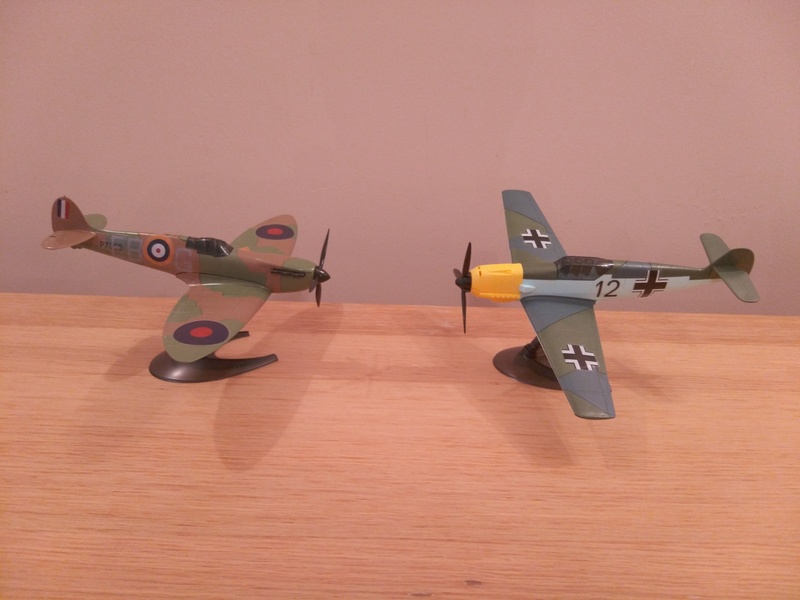 They sent us a Spitfire and a Messerschmitt in the Quick Build version and the same in the normal Airfix starter model sets. I had tried Airfix a couple of years ago when I was 6 or 7 but had found it quite tricky at that time and so although I love any building toys and activities it hadn’t really been a range I had looked at recently. When the sets arrived both my Dad and sister were keen to get involved. The Airfix Quick Build Sets are aimed at children age 5+ so it seemed like it would be alright for Lottie to try and we set a challenge to see if we could build ours quicker than Dad could. I got started on the Quick Build Spitfire, Lottie on the Quick Build Messerschmitt and Dad on the original sets. I was able to get straight on with the Airfix Quick Build, the instructions were really easy to follow and it went together really well. Lottie found it slightly more complicated but still managed to follow the instructions and build it mostly herself with just a little bit of grown up help- sometimes she wasn’t quite sure what she needed to do next and a couple of times she couldn’t quite clip the pieces together fully . We think it was still very good for the first time she had made something like this and we also think if she was more used to building construction type models she wouldn’t have needed any help so think the guidelines of 5+ are about right- she is 5 and didn’t need too much help really. We were both very pleased with the finished models and Lottie was really proud of her building. Once we finished Dad let me paint this one- I think it came out quite well for our first attempt! We will definitely be revisiting the Airfix range- I loved the idea of the Airfix Quick Build sets. It was good that we were able to get on with it ourselves and it didn’t need lots of setting up or worrying about paint, glue and making a mess. I also like the fact that it comes with a display stand too so you can play with it and also display it like a proper model. I really loved doing the Airfix starter sets too as although I found bits of it difficult I really enjoyed this as an activity to do with my Dad.